It seems romantic and adorable to buy a puppy and pop a red bow on it. But giving a puppy as a gift may be a bad idea. Pets are very personal and require a decision that will last for many years. We must consider the longer-term implications when giving a puppy as a gift. Will the new owner have the adequate time to take care of the pet? Does their living situation allow for pets – apartments, home owners associations, allergies, etc.? Are they able to commit long term? First and foremost, we must understand that a large percentage of puppies that we buy from pet stores and over the Internet are from puppy mills. Puppy mills are notorious torture chambers for dogs. Since we are getting our children a pet to teach compassion, humane treatment of animals and responsibility, we should strive to educate ourselves and our children about where these pets come from. Taking a trip to a local shelter, rescue or SPCA is a great place to start. Also, many rescue organizations will allow visitors at their adoption events and even offer foster opportunities to families. In fact, even some larger shelters are now offering foster opportunities that can solve this issue. Then if you really fall in love with the pet, you can end up adopting. Consider a gift certificate to a local shelter, SPCA or humane society. From there, you can be an exciting part of the process and go on a journey to find a best friend for your child or friend. Make a commitment to bring your new pet home in the spring, or at a time when the household is not as hectic. The holidays can mean a lot travel, or many family members visiting. This is not always the best time to introduce a new puppy or dog into the home. Never buy a pet over the Internet. If you can’t visit the facility where the puppy came from, you should assume the worst. Websites can be very deceiving and oftentimes the pictures you see are not even from that breeder. A good breeder will encourage you to come visit and be a part of the process, meeting the parents of the dog, meeting you, etc. This is a huge decision that has implications to more than just the dog you’re getting. You would not want to know that the mamma of the puppy is living in horrid conditions just so you could have a puppy, so do your homework. Remember that puppies are a lot of work. For the first few months you will be dealing with destructive behaviors including indoor potty mistakes, chewing, barking and more. Many rescues have great dogs that are already house broken and just looking for a new home. Consider finding an adult dog instead of giving a puppy as a gift. If you are insistent on certain breed, do some research and consider rescue groups for that specific breed. Then ask many questions face to face. Will they take the dog back if it doesn’t work out? Do they have health records for the puppy and its parents? Do they offer puppy training? Get references from past purchases. A new dog or any pet can provide tons of joy and love. Be sure to think through this decision carefully, as it is one of the biggest you may ever make! 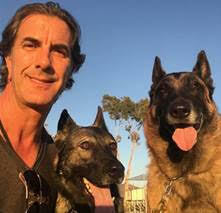 Robert Cabral is an LA-based dog author, trainer and founder of Bound Angels, an organization that provides unique lifesaving services to shelters, humane societies and rescue organizations nationwide.